As one would expect, Betty Taylor is the best known in South Eugene. Councilors Alan Zelenka and George Brown also represent the area. Long-serving councilor George Polling is also well known. Chris Pryor, from out the area and less long serving is much higher on the list than one would expect. There is one very unexpected result. Though Claire Syrett has been in office longer than Evans and caters to that area (e.g, a leading Paid Sick Leave advocate) she has the lowest Name ID. QUESTION: Now, I am going to read the names of some people. Please tell me whether you have heard of each. IF HEARD OF… Do you have a favorable or unfavorable opinion of ______ IF FAVORABLE OR UNFAVORABLE: Is that strongly or somewhat? Other persons and organizations tested. METHODOLOGY: Pooled dataset of 800 cases based on four survey. Each survey was comprised of 200 live telephone interviews of likely City of Eugene 2014 General election voters. These were conducted on July 8-10, July 23-24, July 30-31, and September 15-16, 2014. The margin of error at the sample median is plus or minus four percent for the complete sample. Totals may not equal 100 percent due to rounding. The margin of error at the sample median for the South Eugene sub sample of 310 is plus or minus six percent. 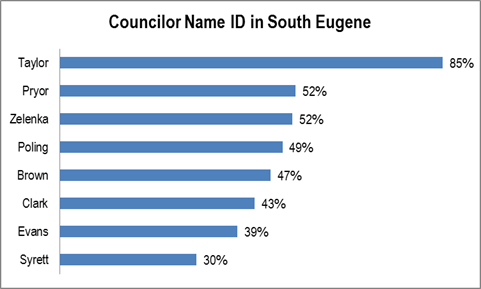 South Eugene includes wards 1, 2, and 3. 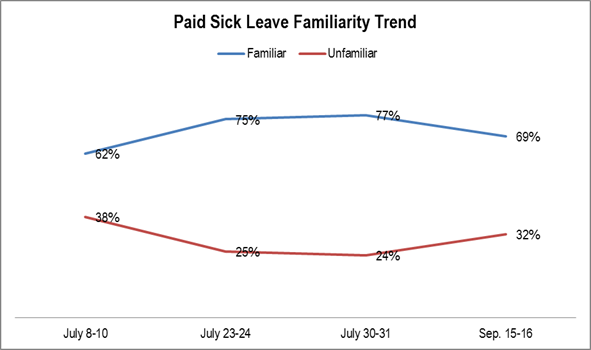 Approval for paid sick leave has returned to its earlier levels. This is probably due to the lack of any significant opposition after passage. METHODOLOGY: 200 live telephone interviews of likely City of Eugene 2014 General election voters conducted May 28-29, July 8-10, July 23-24, July 30-31, 2014, and September 15-16. The margin of error at the sample median is plus or minus seven percent. Totals may not equal 100 percent due to rounding. 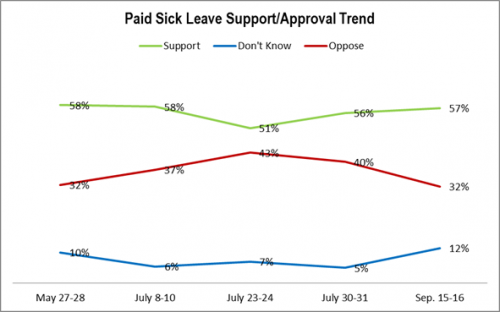 Familiarity is declining now that the issue is no longer as top of mind. QUESTION: How familiar are you with the ordinance: very familiar, somewhat familiar, somewhat unfamiliar, or very unfamiliar? 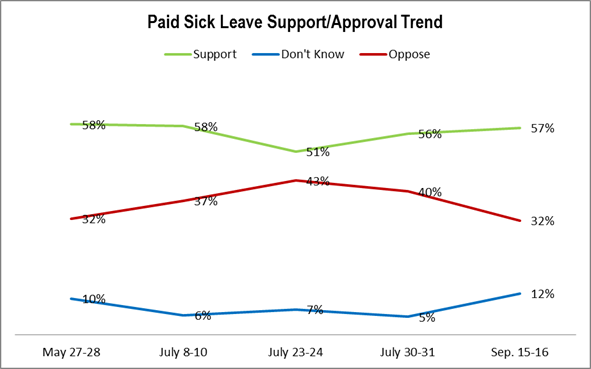 METHODOLOGY: 200 live telephone interviews of likely City of Eugene 2014 General election voters conducted July 8-10, July 23-24, July 30-31, and September 15-16, 2014. The margin of error at the sample median is plus or minus seven percent. Totals may not equal 100 percent due to rounding. 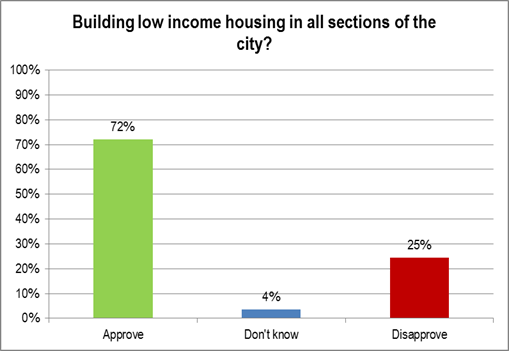 There is strong support for building low income housing throughout Eugene. QUESTION: Do you approve or disapprove of building low income housing in all sections of the city? METHODOLOGY: 200 live telephone interviews of likely City of Eugene 2014 General election voters conducted September 15-16, 2014. The margin of error at the sample median is plus or minus seven percent. Totals may not equal 100 percent due to rounding. Eugeneans are evenly split between approval and disapproval. This is similar to results from last May when the split was 46-46 (http://lindholmcompanyblog.com/?p=10666). This even split implies the city hall proposal is relatively controversial. Government officials who have invested significant planning effort studying an issue generally get some level of deference. 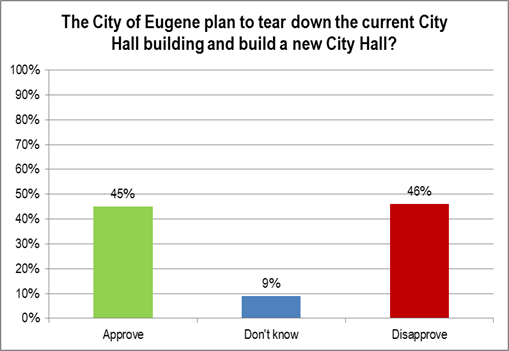 QUESTION: Do you approve or disapprove of the City of Eugene plan to tear down the current City Hall building and build a new City Hall? Eugeneans are very familiar with the proposal. One would expect high familiarity given how long the issue has been discussed. 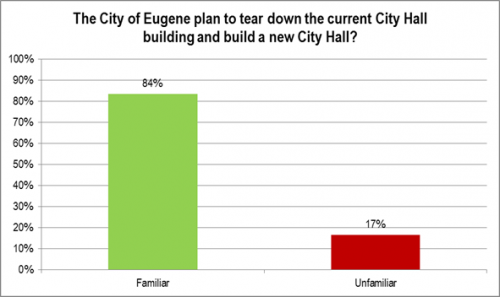 QUESTION: How familiar are you with the City of Eugene plan to tear down the current City Hall building and build a new City Hall: very familiar, somewhat familiar, somewhat unfamiliar, or very unfamiliar? Though there is a very high level of familiarity with the plan, the approval level is comparatively lukewarm. 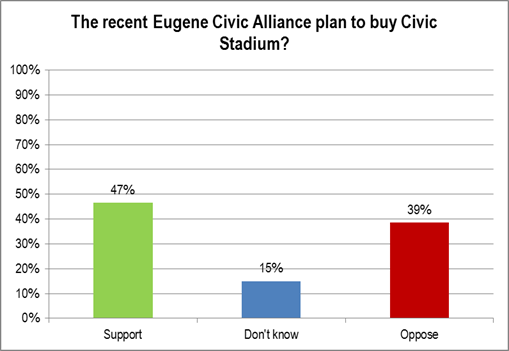 QUESTION: Do you approve or disapprove of the recent Eugene Civic Alliance plan to buy Civic Stadium? 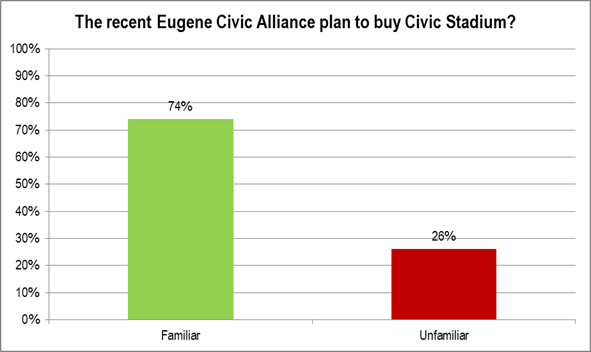 Eugeneans are very familiar with the Eugene Civic Alliance plan. This is clearly a widely followed issue citywide. QUESTION: How familiar are you with the recent Eugene Civic Alliance plan to buy Civic Stadium: very familiar, somewhat familiar, somewhat unfamiliar, or very unfamiliar?